The Northwest District Dental Association (NWDDA) is one of six components of the Florida Dental Association (FDA). The FDA is a constituent of the American Dental Association. 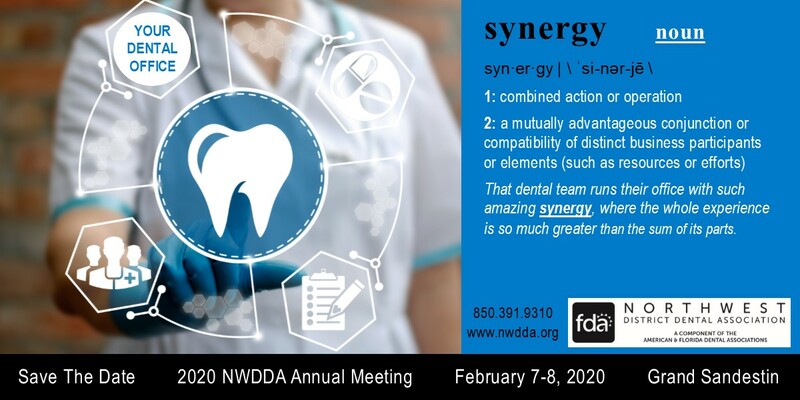 NWDDA is part of a tripartite organization dedicated to serving the needs of dentists and their patients. NWDDA serves Bay, Calhoun, Escambia, Franklin, Gadsden, Gulf, Holmes, Jackson, Jefferson, Leon, Liberty, Okaloosa, Santa Rosa, Wakulla, Walton and Washington counties.